Earlier this year my dad died. He wasn’t an acquisitive man, so he didn’t leave possessions to inherit, but I do have some objects around the house that came from him and one in particular has been getting plenty of use recently. 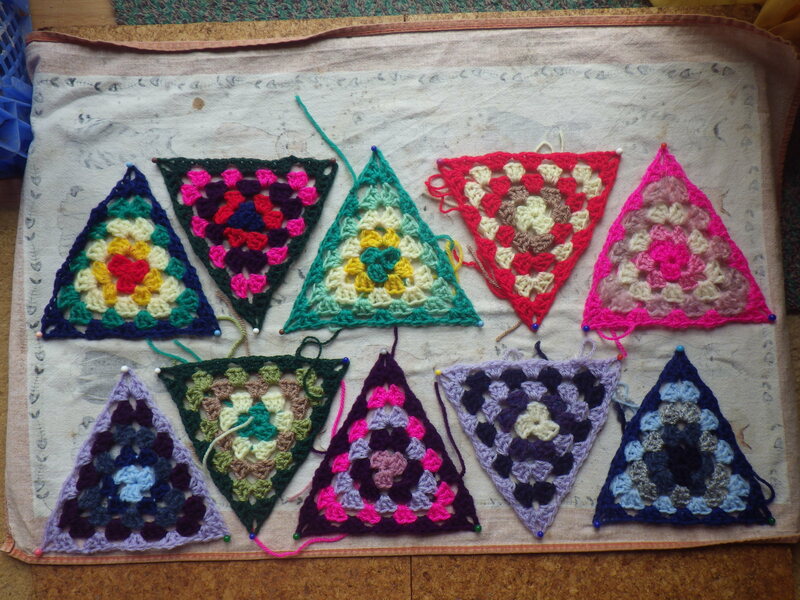 When I was about 14 I became very keen on patchwork and I wanted a board on which to pin out my designs. In those days blocking boards were unheard of and I guess that most people just made do. My dad, being happy to make a variety of things for us (I have very fond memories of our sledge, which he made from old timber and which had metal curtain-track runners and his homemade table tennis table) agreed to make me a cork board for my crafty endeavours. 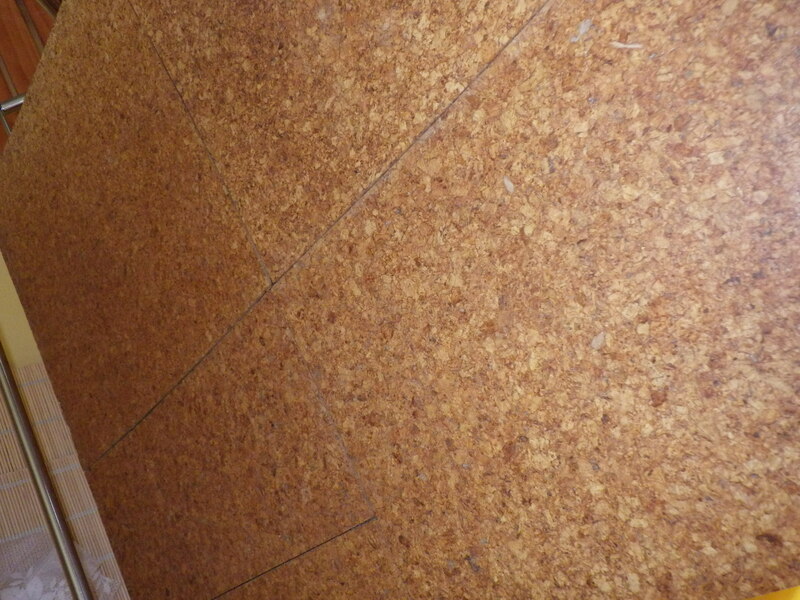 At the time he’d just laid a cork floor in our kitchen and he had a few tiles left over. Those along with a piece of hardboard and some tile adhesive allowed him to create a board for me. As you can see, he was using up scraps of tiles, so it’s a bit of a patchwork itself. Plus, to begin with it was a bit smelly because of the adhesive, but that has faded with the years. When I’m blocking crochet or knitting, I have to cover it with a tea-towel because otherwise it stains my work slightly. However, in combination with some map pins, it is still doing a great job… I’m sure my dad would be pleased. I bet your dad’s thrilled you still use it. I just wish I’d reminded him before he died, but anyway a little bit of him is with me every time I use it. Memories happen all the time. This is a super one for you. I love having something tangible and so useful! And how nice that you still feel the love every time you use it. My father isn’t/wasn’t a great maker of things, but he’s given us all a different kind of legacy, one of the mind. My grandfather did make things, and the toybox he made for me as a very small child was still going strong well into my 30s, when it finally fell apart from over use. With me it is my grandfather who had ingenious ways of solving problems. A few years ago one of my cousins arranged a walk up Bredon hill where he had lived in Kemerton for her 40th. One of the places I visited was a community orchard opposite where he used to live with my grandmother. Honey from the orchard was being sold at the house so I just had to visit. As well as buying the last jar of honey, I also talked to the current owner who bought it from the previous owner who had bought it from my Grandmother when she moved to somewhere smaller after my Grandfather’s death. The current owner told me that he was still discovering new gadgets in the house such as counterweights to make doors open easily etc after three years. I try never to block unless I have to… I’m just too impatient! I have to confess that I’ve blocked the top section, but the bottom section and the side section will have to take care of themselves! I’m sure he’d be smiling too!